This Bridal Jewelry 10 Pcs Set Bangles Bracelets for Women Friendship Bracelets Fashion Jewelry is elegant, special, charming and high fashion. 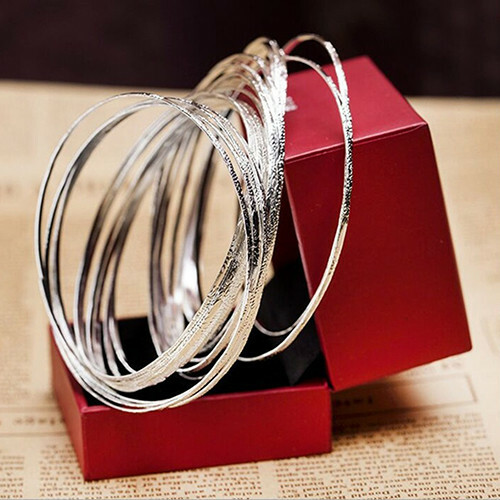 This Bridal Jewelry 10 Pcs Set Bangles Bracelets for Women Friendship Bracelets Fashion Jewelry, is a great choice for any special occasion or dress up a casual look with a little touch of elegance. Get this best deal on Bracelets for Women , Bracelets for Men , Sterling Silver Bracelets , Rose Gold Bracelets , Bracelets for Sale , Friendship Bracelets , Bridal Jewelry , Fashion Jewelry , Vintage Jewelry , Charm Bracelets , Charm Bracelet , Beaded Bracelets , Gold Bracelets , Bangles , Bracelets with free shipping, guarantee. Affordable price. A set of 10 lightweight etched dimpled bracelets. Add an extra luster to your wrist by adorning these bangles that are sleekly designed. All-match, a must-have to your jewelry case.